Clutch purses have never been so hot. Always beware the rich ones. The final skin reveal before the Overwatch Storm Rising event begins tomorrow, April 16, is Socialite Ashe, with a bonus of B.O.B. in his truest big omnic butler form. Socialite Ashe is a legendary skin that was previously teased through a leaked achievement page for the event. 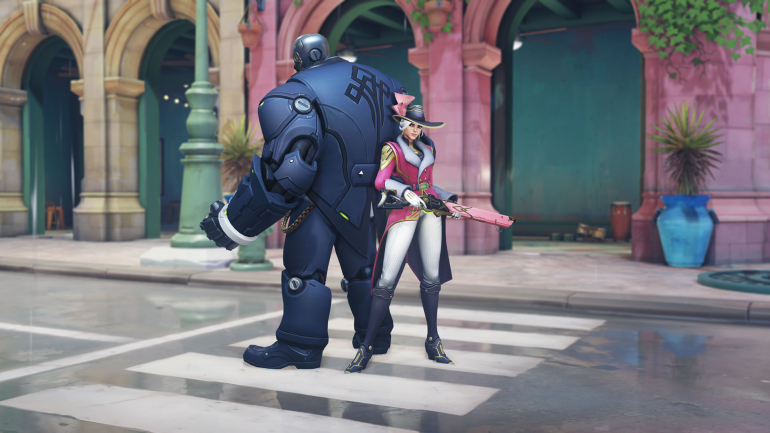 Ashe is dressed in a pink coat, lined in fur and gold, with a matching design on her coach gun. Her pink and gold clutch purse now serves as her signature dynamite. She wears a large black hat with a dramatic pink feather, fit for only the finest of parties. Her companion B.O.B. is decked out in a navy “suit” with gold chains. Before she founded the Deadlock Gang with Jesse McCree, Elizabeth Caledonia Ashe was a rich girl living on her parent’s large Southwest estate. She got into trouble as a teenager and decided to live a life of exciting crime. Ashe’s skin fits the theme of opulence found in other Overwatch Storm Rising skins, such as High Roller Wrecking Ball and Formal Soldier: 76. The Overwatch Storm Rising event begins on April 16 and runs through May 6. It was revealed earlier today that the event’s mission will revolve around the Overwatch strike team chasing down Maximilien, Talon’s mysterious leader. With nine new skins revealed, fans now know exactly what they’re working for during this event.